Well the word is out. Xbox now has TV. What!? Yes it does. Microsoft yesterday announced the launch of cable TV services on their gaming console the XBOX 360. Now things can’t get better. We have already seen the visionary Kinect early this year now we have cable TV services. Now, that’s something very interesting in my opinion. Gaming plus TV on same screen and at same time, XBOX TV is going to be a fun for the next generation. 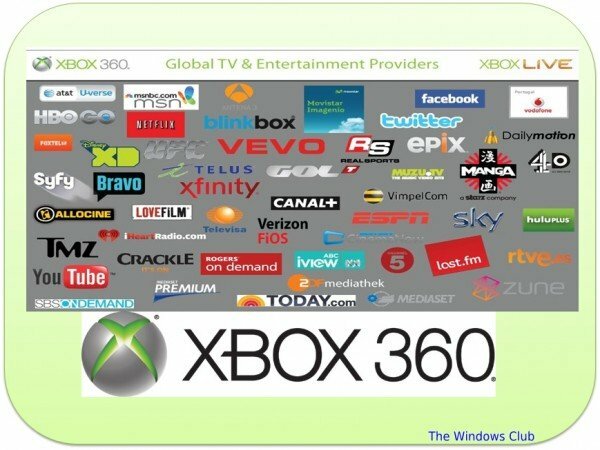 Xbox has signed with 50 TV and entertainment channels to transform Xbox live into full-time entertainment device. The TV entertainment partners list includes Bravo, Comcast, HBO GO, Verizon FiOS and Syfy in the U.S., BBC in the U.K., Telefónica in Spain, Rogers On Demand in Canada, Televisa in Mexico, ZDF in Germany, and MediaSet in Italy,. Search provided by Bing and controlled by Kinect, Xbox will soon be providing new, interactive advertising sold across the Xbox portfolio, providing highly targeted demographic data, and controllable by you, the natural user. If it’s going to work, it’s going to help you big time. With the demise of Zune services early this week, for those of you would have been worried about music and TV streaming – well the solution is here. Getting the complete TV entertainment services on your Xbox, I think it’s a great deal. Speaking about Xbox’s fan base, Xbox Live has 35 million active members worldwide. I expect this service will help in rallying more support. I am personally very excited about this. Being a hard time gamer I usually don’t get time to watch news. Having the leverage to browse and watch TV on my Xbox is what I have been waiting for. With Bing voice support, combined with Kinect’s intelligence and now Cable services, Xbox now seriously threatens the existence of the “remote control”, which is what we have been using for decades now, for switching channels on TV. Today’s announcement is a major step toward realizing our vision to bring you all the entertainment you want, shared with the people you care about, made easy,” said Don Mattrick, president of the Interactive Entertainment Business at Microsoft. “Combining the world’s leading TV and entertainment providers with the power of Kinect for Xbox 360* and the intelligence of Bing voice search will make TV and entertainment more personal, social and effortless. The official roll out date is not yet disclosed by Microsoft. Having support of just 50 entertainment portals it doesn’t seem Microsoft is set to launch it this weekend. this is truly a SMART XBOX… cant wait for launch in india..great work azar..